During the late 70s the handheld “digital” games began to make their way onto the market in force. These were some of my favorite games, and they were the portable version of the Atari 2600—which all this is leading to of course! My first game in this category was Tomy’s Digital Derby, and I remember the small portable interface was just as good, if not better, than the game. 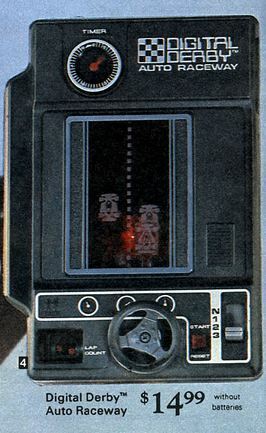 Between the racetrack design, the gears and the small steering wheel controller, it was an arcade game in miniature, and while a radically different scale of micro-technology than what we have now, the idea of a portable video game you didn’t have to hook up to your furniture like TV was profound for a seven year old kid. And Digital Derby was just one of an assortment of games of this type, we also had Hit ‘N Missile and Blip, and the Hit ‘N Missile design was certainly my favorite. I loved the computer screen grid of Hit N Missile, and the fact that you could move the missile with your ship to nail alien spaceships, aa feature which defies all physics. And the analog score keeper was a special touch. What’s amazing about these toys, and I highly recommend you take a look at the YouTube videos below, was how load they were. It was “digital” run my a small battery powered motor inside, and the sound of the game is a key component for the experience, and of course YouTube abides and provides. This entry was posted in 1102xmaS and tagged 1102xmaS, Blip, Digital Derby, Hit N Missile, Tomy, toys. Bookmark the permalink. The bava is all about both the beautiful moment of that flashback and the intersection of the digital and the absurd 🙂 I’m sure both you and your wife have some idea of just how fun this is to do, the web is truly the greatest toy ever. And I’m afraid too often we think about it as something far less exciting. and by He, I mean, of course, myself, using the Royal We. Or, I made a stupid typo. Either way. sigh. Maybe I’m just a pedant, but I spent a lot of time with Merlin. @Brian: I wouldn’t exactly call you a pedant, but you are a bit odd.